I'm sure we've all bought groups which on subsequent research turned out to have added medals/bars. Now I'm not talking about something added by a dealer, I'm talking about medals the veteran actually wore. A perfectly legitimate BWM, VM pair to the Canadian Forestry Corps, but mounted separately a re-named QSA, KSA pair to the same man in Kitchener's Fighting Scouts, complete with bogus regimental number (confirmed as not on the KFS medal roll). 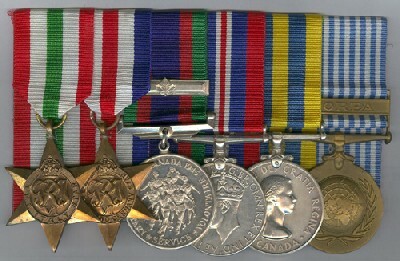 Moving up in time, a 1939-45 Star, CVSM and bar, WM, UNEF, CD combination, courtmounted and plated. I bought it because that combination could indicate a Dieppe veteran. Unfortunately his service record shows that he was RCAF in Canada during the Second War, enlisting in the R.C.O.C. postwar. Both would be hard to sell as they stand. The CFC pair would sell, and I could list the SA pair separately. The other group would need to be taken apart and remounted minus the Star. But I hesitate to do so, because that's part of the group's history. I vote keep them together. Odd things show up with research. If the Canadian Forestry chap was a poseur (and they've always been about since the days of the Roman legions I suspect), then it makes a better story in and of itself. However, sometimes odd things happen. I was an unpaid lackey at a local Senators' office and did mostly medal requests and veterans' affairs stuff whilst I was in Law school. Once I had a request come in for a Soldier's Medal that was supposed to have been awarded to a retired colonel who personally dragged a crewman out of burning bomber on Tinian in late 1945. After almost a years' worth of research requests and counter requests with the archives and some of the least intelligent people I've met in the Pentagon, i got the days' action reports along with a series of other unrelated documents that showed everything happened as the officer said it had, but all the men under his command (whom he had personally led) got the Soldier's medal. The officer had filled out the paperwork for his men, but his CO never did . I did not let this go. 9 (!) years later, after the man had died, we finally were able locate the duty rosters and the units' summary, which had the magical line: "Major Pray led the rescue team personally and was singed by the exploding gasoline tanks as he pulled Sgt. Walters" from the plane." Thus, a mere 62 years after the original incident, his widow got the medal. The original research requests came back with the statement" "There is no record of Major Pray having been in the Asia-Pacific theater". I know that Pte. J.O. Lewis had Volunteer service. I once had a lovely group with an IGS 1854, IGS 1895, QSA, KSA, BWM, VM. The first four were to the KRRC, the pair to the 75th Can. Inf. I knew the KRRC medals were renamed as the first two were impressed, not script. When I got his papers, it turned out he was entitled to every last medal and every clasp. My RCAF chap couldn't have qualified for the Star. I have a similar problem in my own family. My father has added a France Germany Star to his group even though technically he is not entitled. His reasoning is this. To qualified your had to be in an area that was either under enamey fire or potentially under fire. He served in the RCAF Bomber Command and when not over Europe he was stationed in England. On many occasions they were strafed while in their barracks by 20 mm cannon fire from German fighters. So he was actually under fire and therefore entitled to the France and Germany Star. Here's the problem as I see it. Long after he is gone and I have also passed away the next caretaker of the medal group and documents will question whether the medals and the documents belong together. Of course they may surmise that he added the star but research should not be based on guess work. My intention is to remount the group as they should be after he has passed away. I think all such indiscretions should be corrected. I believe it is our duty to set the record straight for future generations. If he was in an "occupational area" for 30 days didn't he merit the 39-45 star? My Father-in-laws' Dad was in the RAF and spent most of 1941-44 in Vancouver and still merited the 39/45 star. He claimed it was because of the Japanese balloon bombs and that that he'd partaken of several recce flights while the Japanese were on Kiska. By the way-no chance the Canadian Forestry chap was either there as a servant/drover or he enlisted under another name? I remember reading once that in the First World War, 1-2% enlisted under false names for various reasons. Personally Brian I would keep the France/Germany Star as it is. Your Dad thought he earned it. Had the 20mm shell hit him he'd have got the medal easily along with a lot of pain and maybe a grave plot. The policy of awarding bars to the Second War Stars has also led to "incorrect" groups. I've seen worn Navy/Merchant Navy groups with both the Atlantic and France and Germany Stars up. The problem lies in that difficult chasm between "deserving" something and actually being "awarded" it. Given the numbers involved, I am amazed the bureaucrats (in- or out-of-uniform) got ANYTHING right in those chaotic post-war years. Until service records become available, we may never be sure what was "awarded" and what was "self-awarded". Those quirky "___ Star without 1939-45 Star" always look odd to me and the miust have done so in 1947 as well? Yes. Few understood that with a few exceptions, the 1939-45 Star was not an automatic award for being in a war zone. That being said, six months seems an excessively long qualification period, especially for the Navy, which couldn't qualify for any other Stars until it had been earned. My father is not alone in this belief, most of the men who served in the air crews felt the same way. I could not respect my father more, however, I am torn between the respect for his belief that he deserved the star and my feelings that history should be set right. I guess I can thank him for my obsession for having things set right. I dread the day that I will have to make this decision as he will no longer be with us. Reading the regulations, I always thought my dad should have had a Defence Medal along with the rest of his WW2 collection - (1939-45 Star, Africa Star, Italy Star and War Medal, plus a US Bronze Star) - but although I had one to hand we decided when he asked me to mount his medals so that he could wear them for Remembrance that as it had not been awarded he would not wear it however much entitled. Brian your dads service - you say "when not over Europe he was stationed in England" - the requirement for the F&G Star for aircrew was "one operational sortie over the appropriate land or sea area". There was no "prior time" requirement for qualification. Qualifying period 6/6/44 - 8/5/45, aircrew service qualifying for the Atlantic Star did'nt qualify for the F&G Star, neither did sories over europe from the Mediterranean area as this qualified for the Italy Star. even if wrong that was "original." The entitlement question is a good one. If somebody SHOULD have received something--but didn't--then while absolutely "improper" it is certainly understandable. Then there are questions about posthumous bestowals. For instance, I applied for and got my grandfather's U.S. WW1 Victory Medal... 21 years after he had died. Is that "his" (he never saw it or wore it) or... "mine?" Not to wear of course, but what I mean is that I'm the only member of my family who ever got it in its ugly little government issue cardboard box. Does MOUNTING a set which the recipient NEVER wore mounted make much sense? From the point of keeping everything together-- sure. From the point of view that HE never WORE them-- no. It comes down to Do It For The Family (whatever it takes ) versus What Will Unknown Collectors Think In 2108? Acctually the tale of the Defence Medal is a very complex one and the qualifications became more and more intricate and confusing (then, as now) as it expanded beyiond its original conception as the "Defence of Britain Medal" (essentially, a "Blitz Medal"). 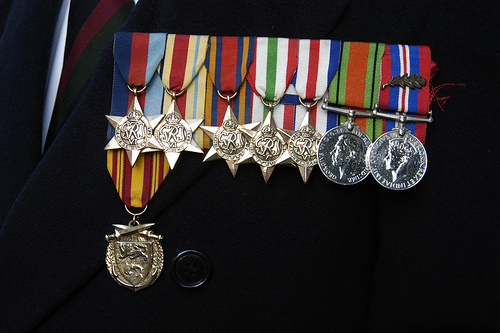 One can display mount medals so that it is clear that they aren't "as worn", however it does suggest same legitimacy. Late (posthumous) claims are a problem. My aunt gave me her husband's medals - CVSM, WM, 1953 Coronation, GVIR CD. When I got his service record, it showed an Efficiency Medal. Then since he had done a Cold War spell at Gros Tenquin with the R.C.A.F., I had her apply for the Special Service Medal with NATO clasp. His group is as mounted and worn. My aunt remembered a green ribbon on his uniform, but not a medal. I have a name-erased Efficiency which I keep with the group and loose SSM. But I also had a miniature group made up to show his full entitlement. The Efficiency Medal is a puzzle. It is clearly on his record with AFRO number. Service-wise it is a little problematical, as it depend how much of his service with the York Rangers was allowable, as one set of enlistment papers lists "Cadets", which I doubt counted. Still there is no entry removing the award on his papers. He died while still in service, so I don't think he monkeyed with his group. I have one such "quirky" group. Lyle Orval DUVAL enlisted into the RCAF in early 1943. He was training as flight crew when, for some unknown reason, he remustered into the infantry in late 1944 (volunteered or volun-told?). Duval arrived in England on 9 December 1944 and, after a period of training, was appointed Lance-Corporal and posted to the Hastings and Prince Edward Regiment in Italy. He arrived in Italy on 7 Feb 1945, thus qualifying for the Italy Star and "starting the clock" on his 39-45 Star. At this time the H&PER, along with the rest of the 1st Brigade of the 1st Canadian Division, were readying themselves for the move to Northwest Europe. In fact, the bulk of the regiment left Italy in late February, but Duval remained until the 10th of March, probably as a member of the rear-party. Duval arrived in France on 12 March 1945, qualifying him for the France and Germany Star and he, along with the rest of his regiment, began the long tough fight to liberate Holland. With the war over, Duval was struck of strength of the H&PER in the field on 16 July 1945. He left England on 6 August 45 and arrived back in Canada on the 7th of September. He was discharged from the Army in May 1946. He rejoined in August 1950 and was posted to the 2nd Battalion of The Royal Canadian Regiment. He went over to Korea with them in May 1951, was wounded by gunshot in July - returning to duty after a period of convalesance (2 RCR saw quite a bit of action during their tour, particularly at Chail-li and the Songguk Spur). Duval returned to Canada in May 1952, with the rest of the Battalion, and received his final discharge in August of the that year. Back to the question of his 39-45 Star: Duval arrived in the area of operations on 7 Feb 1945 and left it on 16 July 1945 - a total of 160 days - 20 days short of qualifying! Agreed, I always find groups to those late reinforcements to the 1st and 5th Canadian Divisions in Italy very peculiar looking. I have an Atlantic Star, CVSM and clasp, WM group. Most likely Navy, since aircrew would only have require two months to qualify for the 1939-45 Star, instead of six. But he could have been RCAF flying out of Newfoundland, since it was "overseas" since it wasn't part of Canada. Now if he's been an NRMA reinforcement it would have been even stranger looking, as it would lack the CVSM. I have a group to the HLI of C that does - he was one of 83 fatalities suffered by "Zombies" posted to Europe. Michael, "The 1939-45 Star is awarded to all air crew who have taken part in operations against the enemy, subject to the completion of two months in an operational unit". "Air crew service in operations against the enemy between the 8th May, 1945, & the 2nd September, 1945, in the area described in sub-paragraph (iii) (b) above will qualify, subject to completion of two months in an operational unit"
Obviously I've very much paraphrased the sub-para, but presumably your RCAF man did'nt qualify for the 39-45 Star under that one. I'm afraid that I'm totally ignorant when it comes to the RCAF, but could he have qualified under the terms of the first 2 paragraphs? Overall qualifing dates for the 39-45 Star were between 3rd September 1939- 2nd September 1945. As usual I'm confusing myself with these Stars etc, & there's obviously danger in para-phrasing anything rather than quoting exactly. Service on passage to an operational command through dangerous waters counted towards the 6 months qualifying period for the 39-45 Star - would Lyle Duval have additional qualification days towards the 39-45 Star due to travel from Canada to Uk & from UK to the continent? I suppose I'd keep loose "late awards" with a mounted group, but it's all down to personal choice I suppose. Some widows or other next of kin might wish to wear a deceased relatives medals, adding the late award or even remounting them in reverse order to wear on the right breast. That's an interesting point, Leigh. I'll have to check his service file at home. It does state, however, his medal entitlement, and the 39-45 Star is not listed so someone didn't think he was entitled. If the transit time from Canada to the UK and the UK to Italy did count, it might not have amounted to 20 days (probably didn't) but it would make the story more interesting, in that he missed qualifying for the medal by an even smaller margin. In the case of persons in operational service on the 8th May, 1945, that is to say, at the end of active hostilities in Europe, the Italy and France and Germany Stars will be granted by virtue of entry into a theatre of operations, and the prior six or two months service requirement will not apply. A similar waiving of the prior service requirement will extend to the Atlantic and Air Crew Europe Stars. The actual service requirement for the Atlantic Star will also be reduced to entry into operational service, and a similar provision will apply to air crew in relation to the Air Crew Europe Star. The 1939-45 Star will not be awarded in any of these cases in which operational service amounts to less than six or two months respectively." Someone wasn't thinking, of course, since the Air Crew Europe Star cut-off was June 6, 1944. The 39-45 Star could be awarded for service well short of the usual qualifying service eg Dunkirk & Norway campaigns, specific commando raids, airborne troops of the army who took part in airborne ops & completed two months in a fully operational unit. Geoff, mistakes concerning medal entitlement were made back in the 40's / 50's by those claiming or authorising & they're still being made by the staff at the medals office when you conact them re "missing" medals, or at least they were a few years ago. This is a decision I'm having to face right now. My Grandfather served in the British Army from 1906-38, his full group is DCM, 1914 Star trio, and LSGC. He volunteered, at the age of 52, for active service in September of 1939. His health wasn't good (he'd been a POW in the first war for over 4 years - Oct '14-Nov '18) but he was accepted anyway. He was posted to Margate as the RSM of an RASC training depot but died, on active service, in mid-January 1940. My Grandmother remarried a Canadian soldier during the war and came to Canada so my Grandfather's medal entitlement was not checked. I decided to look into it and wrote away to the proper authorities and this past February his WW2 entitlement - a single War Medal, arrived in the post (68 years after he qualified for it)! Now the dilemma I'm facing is whether or not to mount it with his original medals. Had he survived the war this is what he would have done, of course, so I'm leaning towards doing that now. Haven't decided either way yet as there are good arguments on both sides of the issue.